Ira “Babe” Hanford, 88, who is the oldest living Kentucky Derby winning jockey, will return to Churchill Downs for this year’s race. At right, Hanford is shown on Bold Venture shortly after his Derby win on May 2, 1936. Ira Hanford made his first trip to the Kentucky Derby in 1936 as an 18-year-old apprentice jockey who rode long shot Bold Venture to victory in the first leg of the Triple Crown. Since then, Hanford has served in the U.S. military during World War II, retired from long careers as a jockey and trainer, and shared 62 years of marriage with his wife, Ginny. 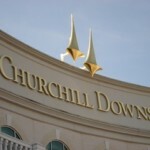 But he has never returned to Churchill Downs since that May afternoon 70 years ago – until now. Next week, Hanford, 88, will go back to the site of horse racing’s most storied and colorful race to be honored as the oldest living jockey to win the Run for the Roses at the Kentucky Derby Museum. 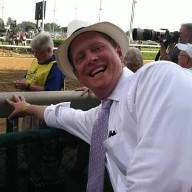 He will be the guest of Jane Dempsey’s Kentucky Derby Junket. 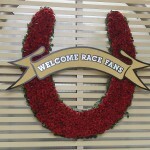 He will also be honored and place his handprints at the Galt House’s Gallop to Glory ceremony. It will be his second time making Derby history. In 1936, he was the first apprentice – a jockey who has had less than one year since their first career win – to capture the Derby. 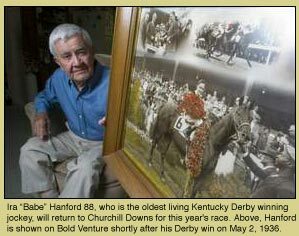 Hanford said before his retirement from riding in 1953, he never had another horse in the Derby so he was always working at another track and could not return. Then, technology intervened. Hanford and his wife now live outside Ocala in the On Top of the World retirement community. But his ride into history began in the small town of Fairbury, Neb., where he was born the youngest of 10 children, which earned him the nickname “Babe” in the family. 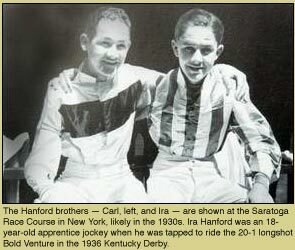 His older brother, Buddy Hanford, was the first family member to enter horse racing as a jockey. Hanford and his brother Carl Hanford soon followed. 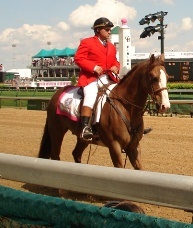 The year before the Derby victory, Buddy Hanford was killed during a race at Pimlico Race Course in Baltimore. Carl Hanford, meanwhile, went on to a storied career as a trainer for Kelso, a thoroughbred which won of Horse of the Year five straight times from 1960 to 1964. Even before Bold Venture, Hanford had brushes with history. 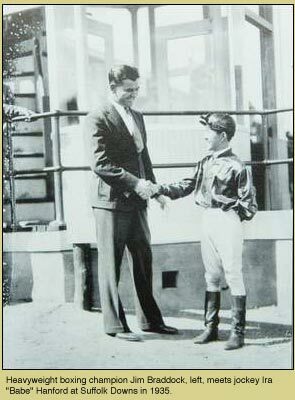 As a teenage rider at Suffolk Downs in East Boston, he met heavyweight champion Jim Braddock, subject of the film “Cinderella Man.” A famous photograph shows them shaking hands, Braddock towering over the young jockey. Hanford said he also rode three races on a then unimpressive 3-year-old by the name of Seabiscuit. “He was a late developer, so at the time I rode him he wasn’t the champion he became later on,” he said. That was not the case with Bold Venture, who Hanford believes is one of the most underrated Kentucky Derby champions in history. Bold Venture had only one race as a 3-year-old leading up to his start as a 20-1 shot in the 62nd Kentucky Derby. But Hanford said trainer Max Hirsch had unflinching confidence in the horse and the apprentice jockey he chose as rider after intense training in South Carolina. “He went down there for one reason, to win it,” Hanford said. But Hanford’s history-making win also had a major consequence. The young jockey was suspended 15 days for a bumping incident at the start of the race. He said on the way out of the gate, another horse crashed into Bold Venture “like a bowling ball hitting the pins” and started a chain reaction that knocked another jockey to the ground. Two weeks after the Derby, Bold Venture went on to win the Preakness with a different jockey aboard. But Bold Venture never got a shot at the Triple Crown, or raced again. Hanford said a tendon injury ended the horse’s racing career, although he went on to sire Assault, who won the Triple Crown in 1946, and Middleground, who won the Kentucky Derby and Belmont Stakes in 1950. “He certainly was a far better horse than most people even know about,” Hanford said of Bold Venture.